When in the Galapagos Islands, I traveled for eight days from island to island on an 80 foot yacht. Most of the traveling between the islands was done at night to preserve time to visit the islands. Therefore, each morning when I woke up, the yacht was at a new location and the view totally different. Above is an image I shot from the upper deck as the sun was rising. That morning’s sunrise was the most spectacular during my visit, because the sun’s morning light colored the clouds in gorgeous soft, glowing colors that framed an island’s silhouette. It was a sunrise I will always remember. 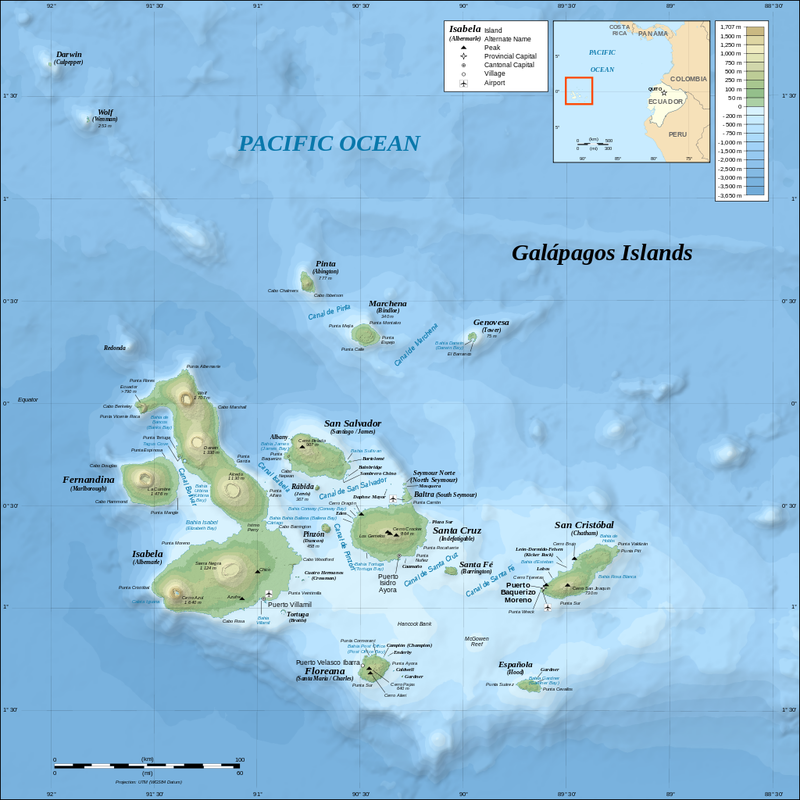 As you can see in the above map, the islands vary in size and cover a large area of the Pacific Ocean. They consist of 18 main islands, 3 smaller islands, and 107 rocks and islets. 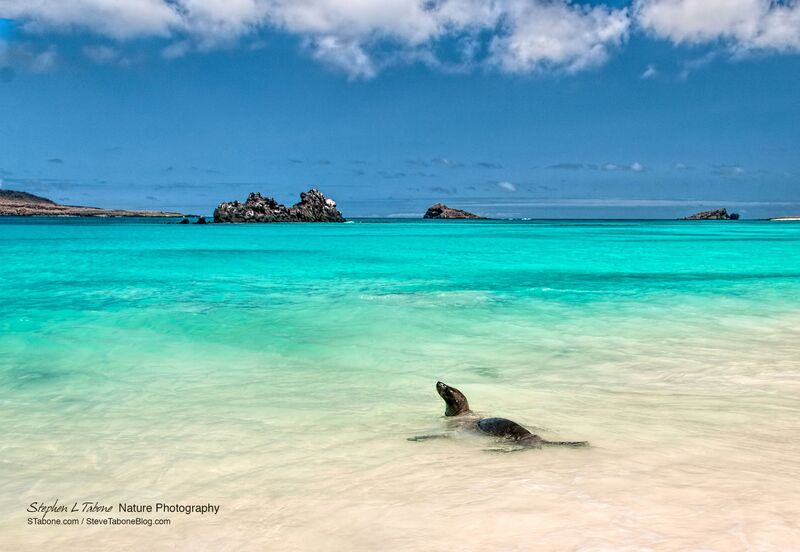 The Galapagos Islands are about 600 miles west of Ecuador, the South American country that owns and protects them. In 1986, 27,000 square miles of surrounding ocean was declared a marine reserve, meaning the waters and islands are protected against fishing and development. In 1990, it became a whale sanctuary. One of the islands I visited was Espanola. It had the most beautiful beach I have ever visited. As you can see from the above and below images, the beach was lined with volcanic rocks, causing waves to splash high into the air. The color of the water varied from shades of blue to beautiful turquoise. Best of all, the beach was totally deserted, no people, no buildings, no signs, and no litter. 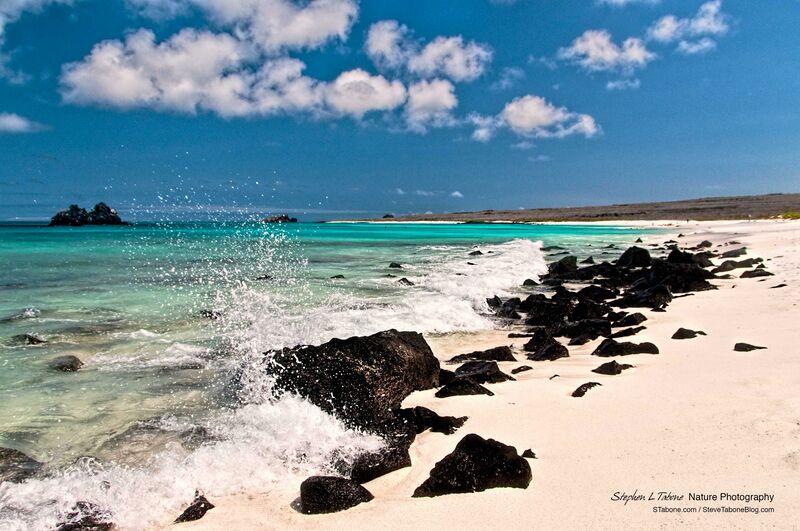 The beach was unspoiled and as natural as it was when Darwin visited the Galapagos in 1835. Espanola Island’s beach was breathtaking. I did not want to leave and hope that I will visit it again. Although I did not have to share the Espanola’s beach with people, I did share it with a group of sunbathing Sea Lions. They, as well as most of the fauna in the Galapagos Islands, were not afraid of people. Therefore, I was able to get close while trying not to disturb them. While photographing the sunbathing female Sea Lions, a large bull Sea Lion kept an eye on me from the shoreline. The male Sea Lion eventually left the water and approached the females. Clearly, this was his harem of Sea Lions. As he approached them, one of the females raised her head, and the very large male stretched his head out, and they appeared to kiss. I am sure that is not what they did, but they were clearly showing affection toward each other. As I walked along the beach, I noticed a single female Sea Lion rolling in the surf and enjoying the warm water and sunshine. I have many images of her in the water to include one when she was floating on her back. The setting was beautiful. I could have watched her all day frolicking in the surf. Sea Lions have earflaps; Seals have earholes. Sea Lions have long whiskers; Seal’s whiskers are crimped or beaded. Sea Lions have long hairless fore-flippers; Seals fore-flippers are short and have claws. Sea Lions hind flippers rotate underneath and enable them to walk on land; Seals move on land by wiggling on their bellies. 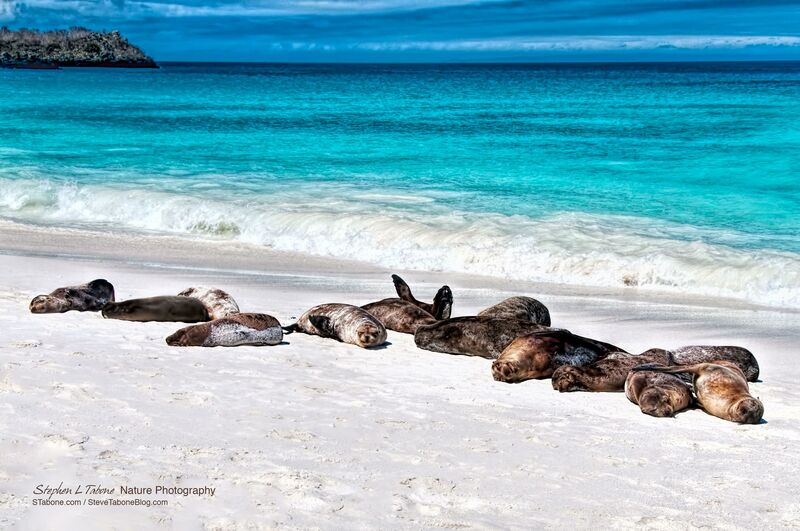 Sea Lions swim using their fore-flippers like wings of a bird; Seals swim by steering with their fore-flippers. 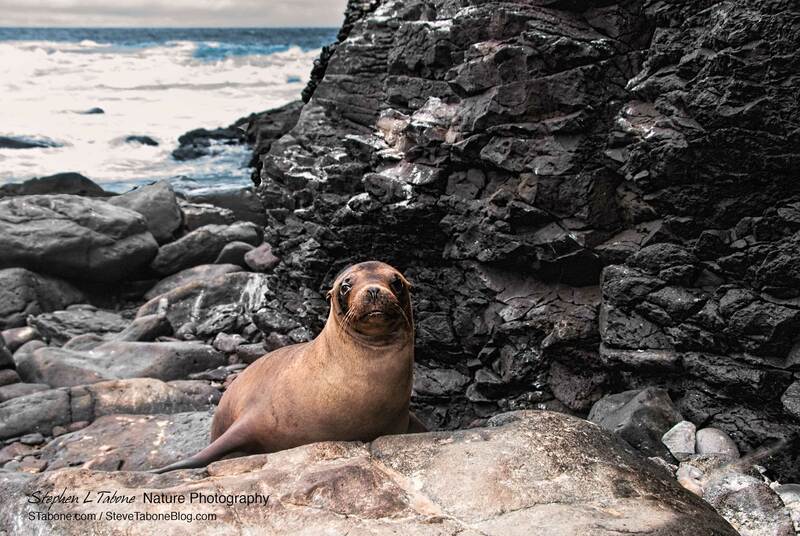 Below, a female Sea Lion watched as I photographed her among the volcanic rocky shoreline. 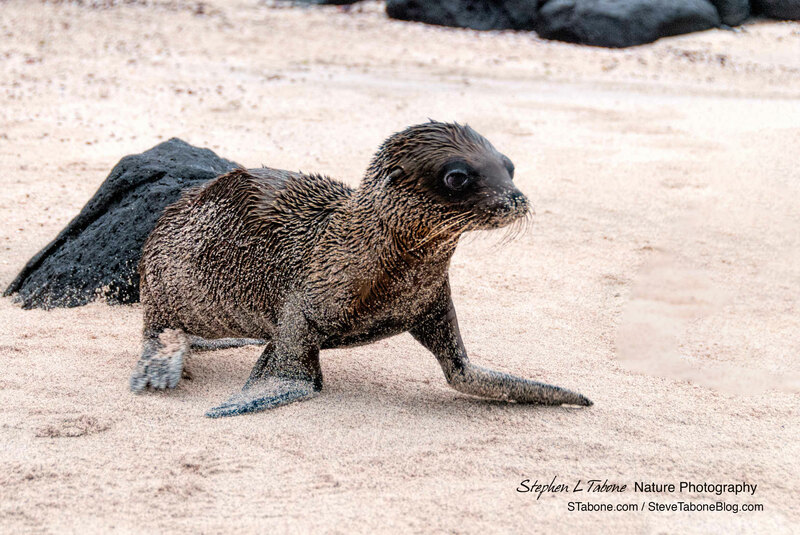 A young Sea Lion pup, covered in sand, was walking along the beach, and of course, I could not resist photographing it. Below is another view of Espanola Island’s beach. 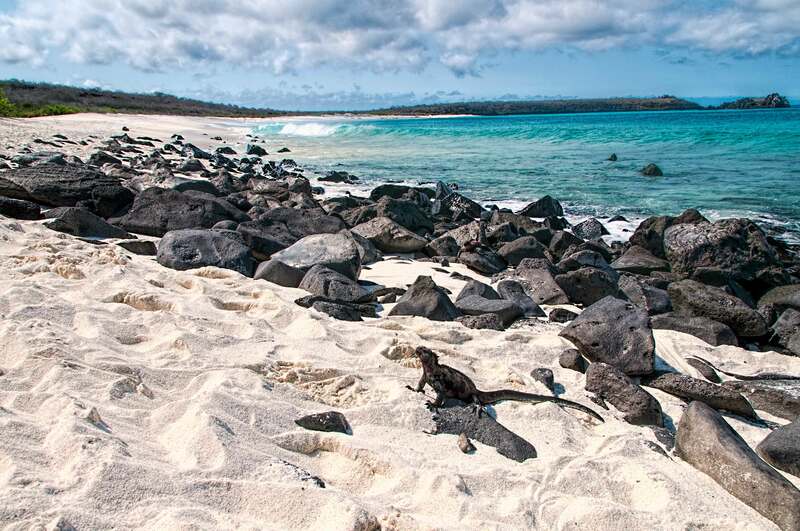 Occasionally, there were Marine Iguanas sunning themselves on the beach. One can be seen in the below image. I have many more images of the Marine Iguanas and will do a separate blog article about them. 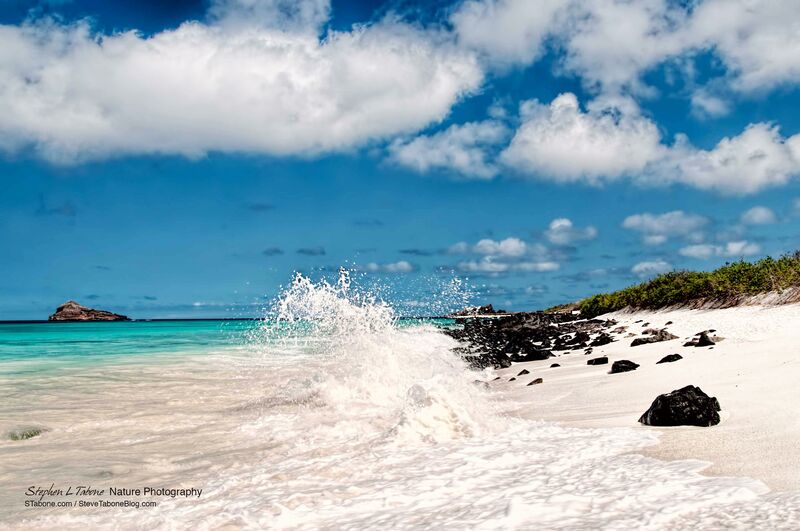 Hope you are enjoying seeing some of the Galapagos Island’s beauty in my photography. I have many more images to share in future articles. 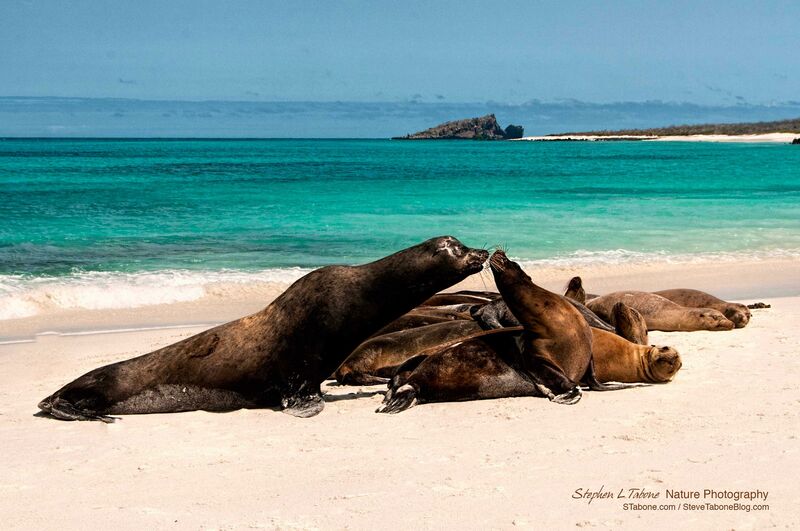 This entry was posted in Galapagos Islands, Landscape Photographs, Nature, sunrise, Wildlife and tagged Beach, Espanola Island, Galapagos Beach, Galapagos Islands, Sea Lion, sunrise. Bookmark the permalink. Steve, another great post with interesting information about a place that we have all heard of, but know very little about. Great photography as usual. Thanks! It’s like being their – that must have been a wonderful trip – look forward to seeing more shots down the road. These images are amazing! How absolutely beautiful and I can see why you want to return and as always, your blog is a great read! Great as usual Steve, it looked as though you were the only human there. Was that the case? What a bautiful place. We envy you. No , not really. Surely appreciate your sharing this with us. That blue ocean is truly incredible ! I missed this island, but am truly enjoying your captures from your visit there.